reread: Twilight wrap ... where's this made? The BrisStyle Twilight Indie Market was a smash hit, even with the hoards of Brisbane peeps at Woodford for Splendour we had a good crowd. The ambient light was excellent so my lighting worries were soon abated. I forgot my camera so I have nicked a photo taken by Wicked Child! Everything at the BrisStyle market is handmade locally, I love being a part of something like this. So many markets have stall holders flogging cheap imports. 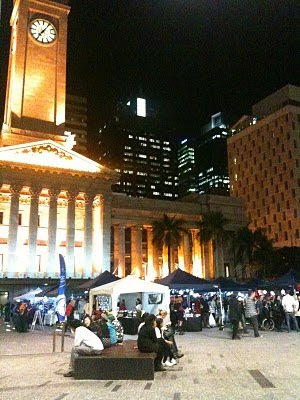 Our markets are real Brisbane craft, sold by Brisbane locals. I think the tourists that come by our markets appreciate a memento that's not made in Indonesia. I did have one guy pick up of of my softie dolls and ask 'where's this made?' ... I said 'by me!' He seemed a bit surprised that it was handmade. He ended up buying it though! I got myself a gorgeous one-off cup from Spun Mud. It's a birthday present for a friend that drinks gallons of tea at work. I also scored a cute little Alice in Wonderland brooch from Hungry Designs. This will be coming to work with me Monday! Cool purchases Hayley. Wish I had time to shop that night. Good to see you had a great market. Love reading your blog posts btw. They crack me up, which is what I truly need when I'm at work. Those doll are so cute! You are so talented!